Open houses present great opportunities for you to represent your brand, capture new leads and engage potential future clients. But they can also be a bit hectic. There’s a lot to do in a short amount of time. So, consider using one of these open house apps to help keep you organized as you plan your next event. The Open House Toolkit, designed by Pete Zizzi – a broker with Re/Max Plus, was built by agents for agents. It works both online and offline, and links to multiple devices. It is a paid app, but once you see what it’s capable of, it’s easy to justify the small cost. After the open house, you can send reports to the seller and 'thank-you' correspondences to the attendees in under 30 seconds flat. With work done that fast, you'll can enjoy a lot more free time. Adding your listings to the app is as easy as 1, 2, 3! Don’t present leads with a boring old sign-in form, spruce it up with a custom slideshow running in the background! Run reports on number of attendees for your open houses and send them over to sellers, team leaders or builders with ease. Lose your tablet? No problem. All your data will sync with another device with ease. To learn more about Open House Toolkit or to download the app, visit: www.openhousetoolkit.com. Open Home Pro is the most prominent open house app on the web – and for good reason. Though not as feature-rich as some of the other options out there, this app is free, has a lot of great tools, boasts an attractive design and is easy to use. You will be up and running in minutes and be able to capture, download and action lead information faster than ever before. No more Mondays spent deciphering visitors’ handwriting and typing details into a spreadsheet or CRM. Get more leads, close more sales, increase your productivity. Find out if your visitor is already working with an agent and if they are pre-approved for a mortgage. Add notes about your visitor’s comments, likes and dislikes. After the open house, the system automatically sends a follow-up email with your contact information to all registered attendees. Export all collected data to a CSV file and import it into the CRM of your choice. To learn more about AM Open House or to download the app, visit: www.openhomepro.com. The AM Open House App is another great option for agents seeking an organizing solution to help streamline their open houses. 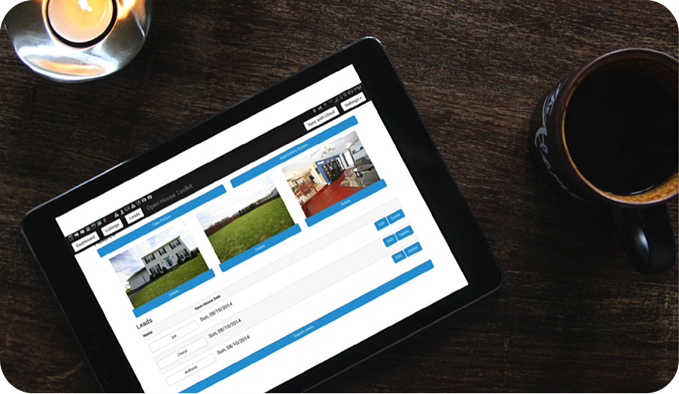 The app is free – but users can pay for access to premium website features that make managing open houses even easier. “The ink stops here! We’re taking the “pen” out of your next “open.” AM Open House is a new app that was designed with agents, buyers, investors and sellers in mind. Easily share your open house on your social networks or via text message. The app fills in all the details, just click share and you’re set! Attendees can easily leave their feedback and the app pulls it together into one collective reference for you. Each property you add to the AM Open House App automatically gets a mobile-friendly single property website – great for sharing. A two-button interface makes logging your attendees easy. To learn more about AM Open House or to download the app, visit: www.amopenhouse.com.